There is a free hotel collection from strategically placed hotels in all of the main central London hotel districts. Separate coaches each cover a main Central London hotel district and transport you to Victoria Coach Station where you join the tour bus for your day tour. The hotel pick-ups are performed between around 7:30 a.m and 8:15 a.m.
A full list of the hotels on the pick-up service are on the booking page linked from the banner at the foot of this page. If your hotel is not on the list there will probably be one very close by. If you require assistance on establishing your best pick-up point use the 'Contact Us' link at the top of the page. If you wish you can join the tour at Victoria Coach Station, which is about 600 yards from Victoria Underground and Train Station. A professional guide is aboard the luxury air-conditioned touring bus the entire day and will provide commentary and guiding throughout. 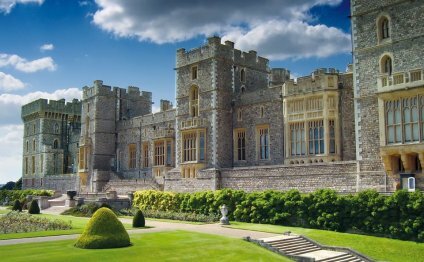 Windsor Castle, the first stop on the tour is a short 45 minute journey west of London. During that short time you would have heard about Windsor Castle its history and interesting snippets from your guide. Windsor Castle opens at 9:45 a.m. so we will be arriving around the time the castle opens to the public. Built high above the River Thames, Windsor Castle has been home to the Royal Family for 900 years and is still an Official Residence of the Queen. We visit the magnificent State Apartments, still used for State occasions and Royal receptions. Take some time to explore the castle grounds and the fourteenth-century St. George's Chapel, one of the most beautiful examples of medieval church architecture in England and a burial place of kings and queens, including Henry VIII and his third wife Jane Seymour. Windsor itself is a pretty town full of traditional shops and historic pubs. Immediately outside the castle is the Old Town with its cobbled streets. Its now late morning when we depart Windsor and make the approximately 80 minute journey to Stonehenge. Early legends link it with Merlin and King Arthur, but over the last hundred years the midsummer sunrise has attracted pagan groups and followers of the Ancient Order of Druids. We will spend best part of two hours here at Stonehenge, plenty of time to take in Stonehenge, take in the Stonehenge exhibition and visit the gift shop or grab a coffee. After leaving Stonehenge its onto our final stop Oxford, the famous university city, north from Stonehenge. This is the city of Dreaming Spires and home to the world's most famous university. Its colleges date back to the 13th century, an inspiration to generations of scholars including President Bill Clinton, and the authors J R R Tolkien, Lewis Carroll and C S Lewis. Your Evan Evans guide will take you on a walking tour to see Christ Church college, the Bodleian Library and the Sheldonian Theatre and much else besides. Its now very late afternoon when we leave Oxford for the journey back to London, the estimated time of arrival back in London is around 7 p.m.
Prices displayed on the banner link below are the current prices of this tour. From the detail page linked from the banner below you can view the complete list of hotel pick-up points. If you are still unclear of the best pick-up point for you, use the 'Contact Us' menu option at the top of this page. From this page just hit the "Book This Tour" button for an instant reservation.